Want to see how close I got to my inspiration? Here’s the reveal of my new craft room! 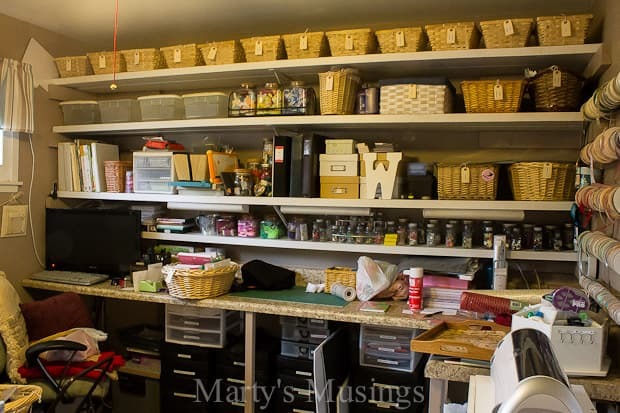 At the beginning of the new year, when I decided my word for 2014 was simplify, I went on a cleaning/organization spree in my craft room. I wasn’t happy with the way the room was functioning. Since I have started blogging full time as a source of income for our family, I no longer have much time to scrapbook. 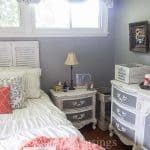 My scrapbook room became a craft room with blog projects in baskets and shoved in closets. I don’t function well in chaos and disorganization. 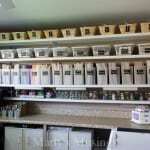 I needed an organizational intervention and some craft room inspiration! 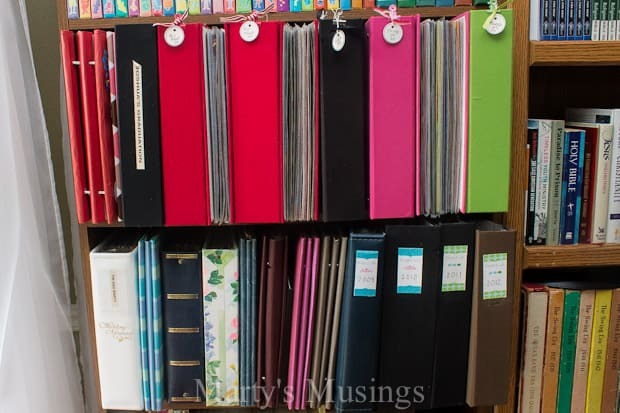 You may remember this post where I told about my paper storage. I love all things paper. 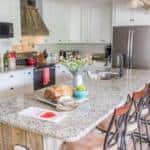 I get inspired just looking at the colors and patterns and letting them encourage me to create, not only scrapbook and Project Life pages but craft and home decor projects. When I designed the room I was thrilled to find these cubbies at Goodwill for $10 each. I believed they would work perfectly for storing my 12×12 paper. I was wrong! They flopped from side to side and the only solution I came up with was to cut wrapping paper tubes to hold up the paper. 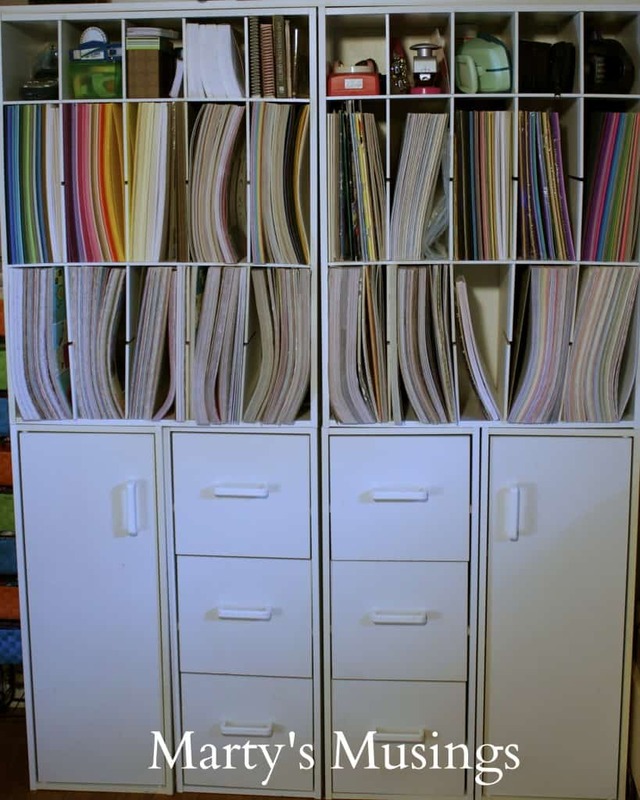 So the starting point for my craft room makeover was finding a solution for paper storage. If you take a look at my inspiration board above you’ll get a hint as to what I found as well as much of the inspiration I used in this reorganizing project. I also filled up two boxes with paper, stickers, albums, scrapbook magazines and miscellaneous stuff! It’s on Craigslist here if anyone is interested! I’m putting the finishing touches on my room and hope to share it with you soon! You can follow me on Instagram to see my progress! Need more inspiration for your own craft space? 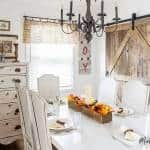 My Pinterest board is chock full of rooms and ideas that will delight you! If you want to see more of my old scrapbook room take a look here. and the way I organize and store my photos and albums. You are so organized!! This makes me want to turn one of our spare bedrooms into something just like this!! 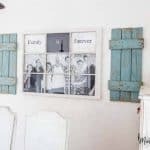 How sweet it will be, for your grandkids and their grandkids and on and on, to look back at all their family pictures you have organized with much love! 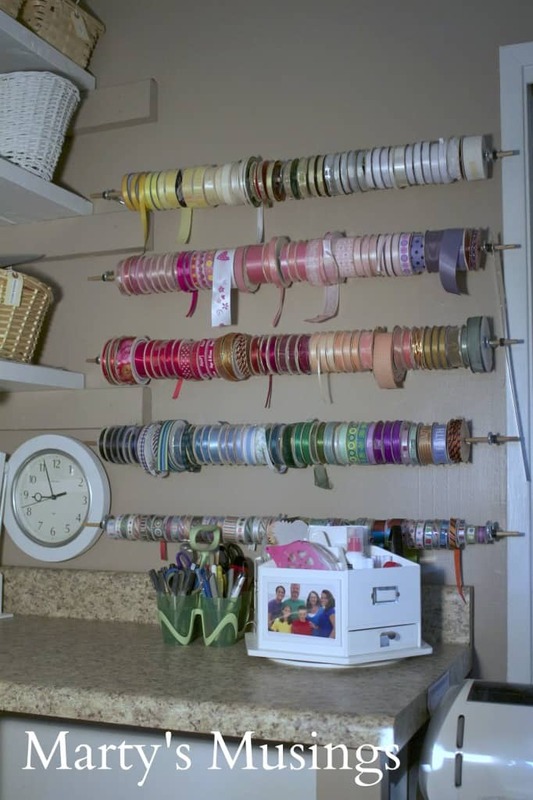 I will definitely be doing your ribbon storage idea! 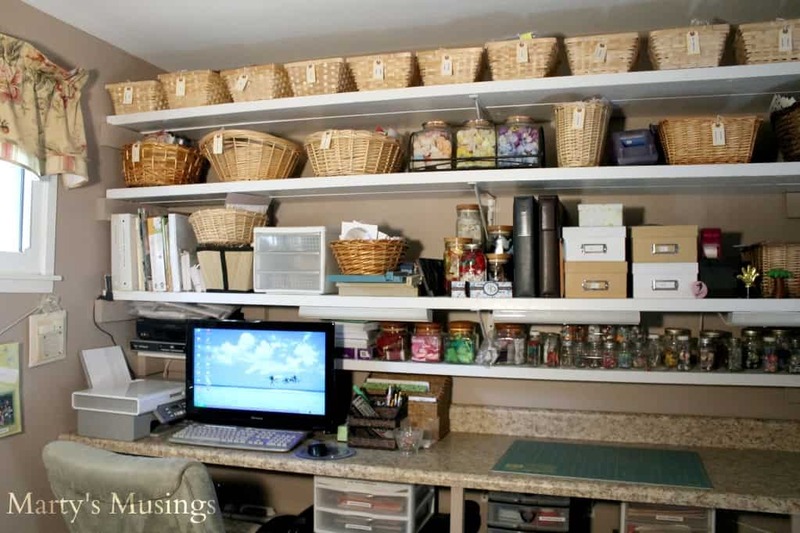 Love your craft room, thanks for sharing Marty! Charlotte, you’re so sweet! I have tons of albums that I’ve spent years making and pouring my life into. I do know it is a gift and one I hope my kids will do for their own family. My blog is also a record of our lives and struggles and dreams, especially in past years when I wrote more personally. It’s good for me to go back and read the transparent struggles and know how far we’ve come. God has been good! 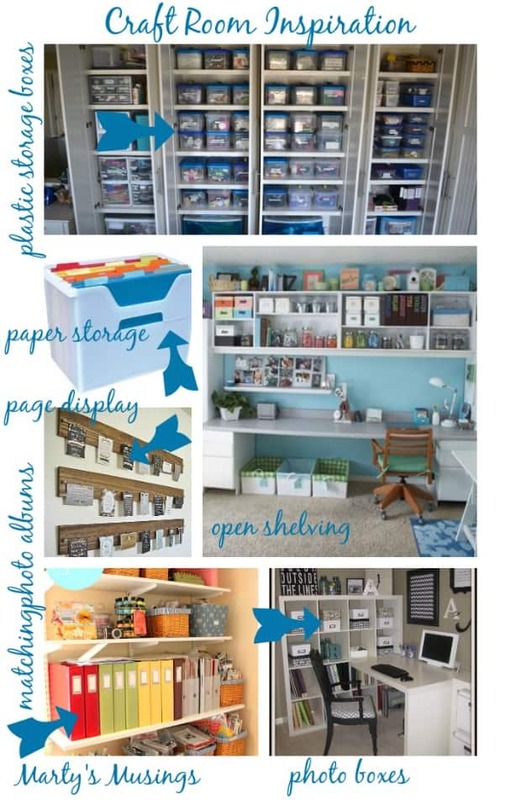 Let me know if you decide to do a craft room. It’s the best! Couldn’t you take cereal boxed and paint and put them in the sections for the paper? Spectacular! Thank you for the beautiful inspiration! I love the ideas that you’ve already incorporated into your craft room, Marty. You’ve already come up with some really clever ideas. I can’t believe your wonderful collection of scrapbook paper and can’t wait to see more! Hi, Renee. I actually had that thought but the units aren’t square and that wouldn’t work. 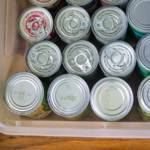 I have a found a solution and I’ll share it when I reveal my new craft room organization! Thanks for stopping by Marty’s Musings. I feel lucky to have gotten a sneak peek at the craft room transformation in progress, but I’m excited to see how it all turns out. You’re definitely going to beat me. My walls are painted, and my bookshelves are halfway organized, but the rest of the office/craft room is in complete and utter disarray. I just push the piles around to work. You would so not want to be in here at the moment! I’m afraid you’re going to beat me, Amy! The bedroom has totally consumed practically every waking moment since we started. I have finally gotten the craft room cleaned up enough AGAIN to find my countertop. I feel like we have had tubs sitting around since the family left after Christmas and I started on Christmas purging. There’s not a lot of inspiration in me right now! I hope these will get you started! The first thing that I thought of with the paper storage was to turn them all sideways. Then your papers will all be flat. Are the tops a separate unit from the bottoms? Wow, you out did yourself! My craft room is one-half of the laundry room, with storage in the garage. Not a pretty sight! !